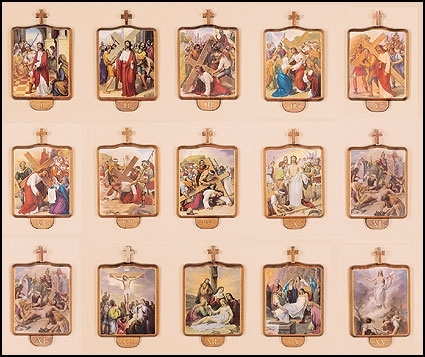 Wooden Stations of the Cross series in genuine Florentine gold leaf with laminated full color lithographs. Entire set of 15. Description: These handsome wooden boxes, carefully laser-engraved with today's most popular prayers and Bible verses, are elegant in their simplicity. Ideal gifts for a man or a woman, they're beautiful and practical.